An out of court settlement has been agreed between Driffield Golf Club in Yorkshire and EcoBunker over a patent for synthetic grass revetting. What follows is a statement the two have jointly agreed. 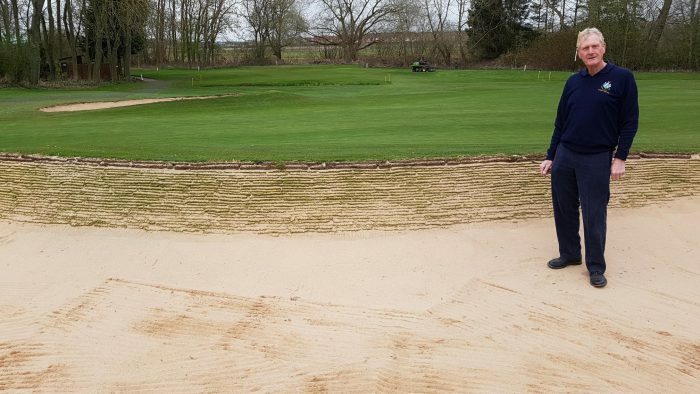 ‘Driffield Golf Club in East Yorkshire (‘the club’) has negotiated an out of court settlement with Richard Allen, CEO of EcoBunker, and the inventor of the patented stacked synthetic grass revetting system. ‘The club accepted that it had used its own supply of waste synthetic grass, and copied the construction method after viewing an article in the trade press in 2015. In doing so, it unknowingly infringed various elements of intellectual property, principally the patent. Justifiably proud of the results, the club posted photographs and news of its bunker re-construction work on social media and it was via Facebook that the patent infringement was discovered. ‘”Despite the fact that EcoBunker’s system has been patented for many years now, we still get many surprised looks when we provide the plain evidence,” explained Mr Allen. “Perhaps this is a reaction to the sheer simplicity of the system. But then again, some of the best inventions are very simple, and in our case, after conducting three years of intensive due diligence the UK Patent Office decided that the system ticked all the boxes required of a patent,” continued Mr Allen. ‘After examining the patent, the specialist legal firm engaged by the club advised their client of the validity and strength of the intellectual property (which also includes a design registration) and encouraged them to negotiate a settlement.